Tomiya Nishimura was born in Saga, Japan in 1946. He received his M.F.A. from the Tokyo National University of Fine Arts in 1972 and spent several years studying in Madrid, Spain. Nishimura has had solo shows at the Komange Kogen Art Museum in Nagano, Japan, the Uma/Niche Gallery in New York City, the Striped House Museum of Art in Tokyo, and the Mizuma Art Gallery in Tokyo. 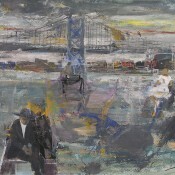 He had first solo show at the Peng Gallery in 2003 and his exhibition ‘Philadelphia’ was shown at the gallery in November 2006. Nishimura has also participated in an impressive selection of group shows across the globe. Tomiya Nishimura creates enigmatic compositions that provoke numerous questions yet offer few definitive answers. His sources are multiple and include childhood memories, images from European art history, and pictures culled from a variety of magazines, brochures, and books. By layering and interweaving this disparate imagery, which tends to span various cultures and time periods, his paintings allude to rich and puzzling narrative contexts. As the title of his exhibition at the Peng Gallery suggests, many of Nishimura’s recent works were directly inspired by his fascination with the landscapes and architecture of Philadelphia. 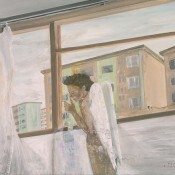 In addition to using pictures taken on previous visits to the city as source material, he also stayed in Old City for two weeks in order to complete several canvases for the show. Nishimura, who first visited the city over four years ago, says that the silence and the stillness of Philadelphia in autumn remind him fondly of his hometown in southern Japan. 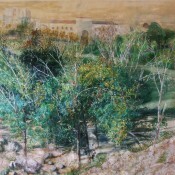 In "A Farewell and a Reunion", for example, the city’s skyline appears above an expanse of trees in the upper left-hand corner next to the Philadelphia Museum of Art’s Perelman Building. The scene, like so many of his recent compositions, is set in the late fall, a period of intense coloration and dramatic transformation. A thick tangle of barren branches mixed with those still bearing their multi-colored leaves covers the surface of the canvas. 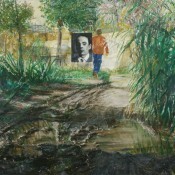 Hidden within the dense foliage we see an unaccompanied female figure in the foreground. A soldier dressed in a World War I uniform kneeling on a tuft of grass appears in the upper right-hand register and across from him a representation of the Virgin Mary inspired by a sixteenth century sculpture. While Nishimura depicts a fairly realistic recession into space, the widely divergent scale of these three figures reveals a blatant rejection of traditional visual queues in favor of jarring and peculiar juxtapositions. Nishimura revels in the often surprising effects achieved by taking found images out of their original contexts and placing them within his paintings. 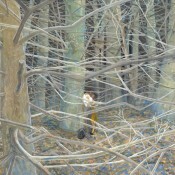 In "Don’t Look For Me" we see a young girl, painted only with grey tones, inexplicably floating in a vibrantly colored and wooded environment. A soldier depicted in silhouette stands menacingly behind her and carries a rifle while a small figure, what appears to be an angel, resides in the foreground. The image of the young girl was taken from a film still of three Japanese ballerinas, the figure of the soldier from a book on Gettysburg bought on one of Nishimura’s previous trips to the Philadelphia area, and the angel from a late renaissance sculpture. The juxtaposition of these diverse sources culminates in a highly charged composition that suggests violence and uneasiness. However, the violence is never realized and the figures remain forever isolated and motionless. 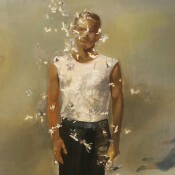 Reminiscence is among Nishimura’s most impressive works to date. Three rows of well-mannered school boys sit awkwardly as they pose for a traditional class portrait. Individual faces are decipherable amongst them yet the image is slightly obscured, emphasizing a certain unanimity and standardization already evoked by the boys’ uniformed appearances. 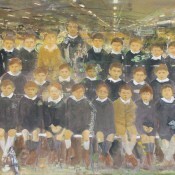 Nishimura found this image of American school children from the 1920s, screened it onto a canvas, and then layered it on top of another picture of an industrial garage. 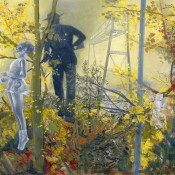 The pairing of these two discordant scenes is tinged with trepidation upon spying a familiar silhouette in the background, that of the same military figure from "Don’t Look For Me". Nishimura’s paintings present us with visual palimpsests that convey, through their often obscure layers, intense feelings of melancholy and apprehension. 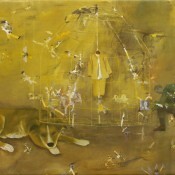 His compositions spur viewers’ imaginations and are intended to encourage a multitude of interpretations and responses.